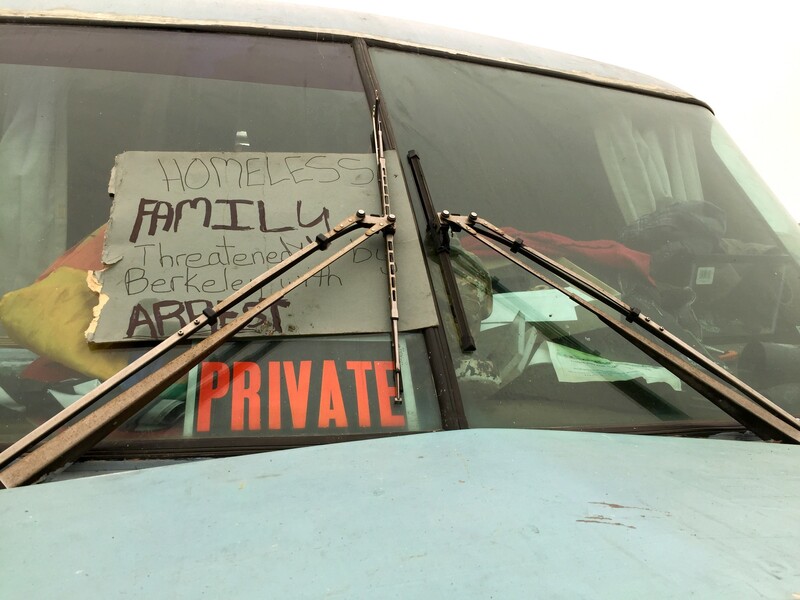 The Berkeley City Manager's plan to evict the vehicle camp was stopped today, but the city council failed to extend a one month reprieve. A protest sign in one of the RVs in the Hs Lordships restaurant parking lot at the Berkeley Marina. Several dozen homeless families and individuals who reside in RVs and cars in a Berkeley marina parking lot were hoping to be allowed to stay for at least one more month, but their hopes were dashed this morning when the Berkeley City Council failed to approve a last-minute reprieve. After the city council failed to provide the one-month stay, some residents of the camp cried. Others told the Express they're not sure where they'll move to and that they've been pushed around Berkeley and other parts of the East Bay due to anti-homeless policies adopted by numerous cities. "I think it's awful," said Kim Majit about today's decision. Majit moved into an RV with her husband after she lost her home in San Francisco to foreclosure four years ago. In an interview yesterday at the marina, Majit said she's inquired with multiple RV parks throughout the Bay Area about renting a space, but they don't have room due to the region's housing crisis, or they have turned her away because her vehicle is older and doesn't have running water. About 33 RVs and buses are currently in the Hs Lordships' parking lot, and dozens more people sleep in cars that arrive each night. She and her husband camped in their RV at several locations in Berkeley until moving to the Hs Lordships restaurant parking lot at the marina's southeast end last month. "I found community here," she said about the camp. "This is like the middle-class. Most people here work." Majit said that her husband works full-time, but after she was laid off they couldn't afford to rent in the East Bay. She's currently looking for work but said the constant hassle of being pushed around makes it difficult to regain her footing. 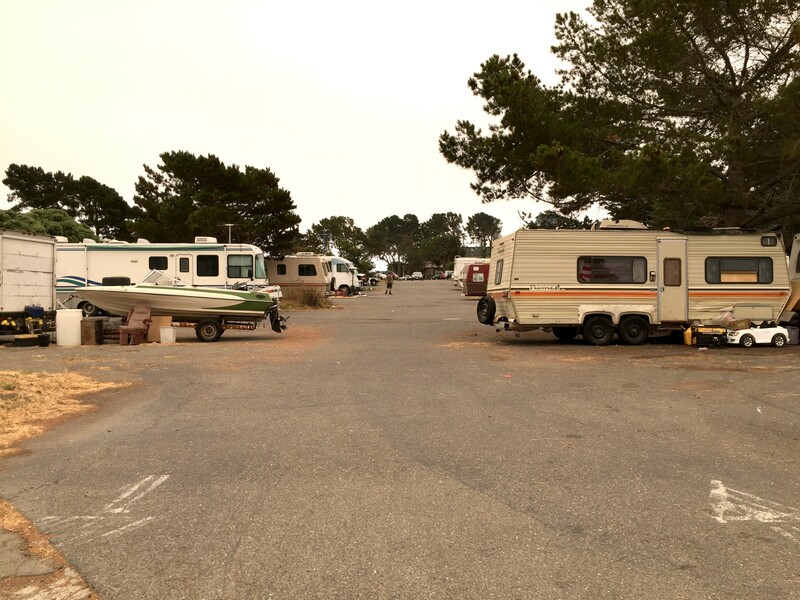 The vehicle camp at the marina currently includes about 23 households in RVs. Many more people arrive in the evenings to sleep alone in their cars. A city memo prepared for the council last week estimated that there are now as many as 200 vehicles used as shelter each night in the Berkeley Marina, with most of them located in the Hs Lordships parking lot. "This community includes nine children," Yesica Prado told the city council today. Prado, who lives in the Hs Lordships parking lot in an RV, is a journalist who has documented what life is like for its residents. She told the council that the camp is "tired of harassment" from the city and reminded them that several of the residents were evicted in May from another nearby location in front of the Doubletree hotel. At its current location, the camp is also home to several seniors and people with physical and mental health problems. Last Wednesday, City Manager Dee Williams-Ridley issued a notice to the campers that their vehicles would be towed and impounded unless they moved out by today. The warning cited a state law against lodging on public property and a city prohibition against camping — two anti-homeless laws that are commonly used to break up both tent and vehicle camps. There have also been complaints made against the camp by housed residents who use the area for recreation. A windsurfer complained during public comment today that he doesn't see the parking lot as being an "appropriate place" for the homeless to take shelter. At today's council meeting, both councilmembers Linda Maio and Kriss Worthington said they've heard stories about people being harassed in the parking lot and cars being broken into. When the Express visited the camp yesterday, it appeared clean and well-organized. Some of the RV residents said they clean up trash that's left behind by both homeless people and recreational users of the area. Several people who didn't appear to be connected to the camp and were headed to the Hs Lordships restaurant sped through the parking lot in displays of hostility. The city manager's office also issued the notice to close the camp because of the upcoming Fourth of July holiday, which draws thousands to the marina to see fireworks. A private contractor operates the parking lot for the holiday and collects revenue from parking. Berkeley's mayor and councilmembers were surprised by the city manager's attempt to evict the camp and in a move revealing a split between the manager and elected officials, the mayor and council stopped today's planned eviction and convened during a special session to try to find a temporary solution. Mayor Jesse Arreguin and Councilmembers Cheryl Davila and Kate Harrison hoped to convince their colleagues to allow the camp to remain in place for another month while scouting a new location. They also requested portable toilets and hand-washing stations be installed. But their measure failed, mainly because Councilmember Kriss Worthington said he couldn't vote for something that would mean the city is violating state law. Worthington said the State Lands Commission, which owns the parking lot where the homeless RV camp is currently located, will not allow any type of residential uses at the location, including a one-month extension for campers to stay. "I was elected to stand up for certain principles," said Worthington after today's meeting. "For the city to break the law, that puts it in a vulnerable position." Worthington cited a 1985 lawsuit brought against the city by a hotel operator as part of the reason for his decision. In 1985, a bus and RV camp calling itself "Rainbow Village" existed near the Berkeley Marina on the old landfill that later was renamed Cesar Chavez Park. Many of the residents were homeless people who had previously been pushed off the city's western streets and so they relocated to the waterfront. In response to the camp's sudden growth, the city council adopted an ordinance permitting people to reside in vehicles. But the State Lands Commission objected to the city's sanctioning of the camp, and then the owner of the nearby Marriott Hotel filed a lawsuit to force the city to evict the RVs. At the same time, two of Rainbow Village's residents were allegedly shot and killed by another resident in August 1985, and by April the camp was closed. But questions have lingered about whether the man convicted of the murders was guilty. Even so, for decades, many have used the crime as an argument against sanctioned camps. "I'm disappointed," Arreguin said after today's vote. While Arreguin acknowledged that the State Lands Commission has, in fact, objected to the idea of the month-long extension for the camp, he noted during the meeting that there are already similar uses at the marina, including a hotel, parking, and people who reside on boats. Harrison observed during the meeting that the current interpretation of what kinds of uses are allowed at the marina "tend to favor well-off people" and exclude those whose use of the land might be compelled by economic insecurity. After the motion to provide a month-long reprieve failed, Harrison made a second motion to allow the campers to stay for one more week. That motion passed after Maio switched her vote to a yes, while Worthington again voted no. "One week is better than nothing," Arreguin said afterward. But camp residents said that the week-long reprieve is cold comfort.